But it seems that not all Pizza Pizza franchisees are on board with the promotion. 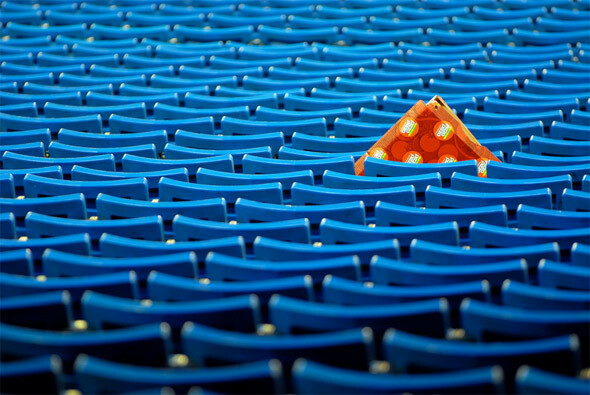 In fact, some have been known to go to extreme lengths to avoid handing out those prized free slices. Although I have had my own experiences with this promotion, I didn't realize that this was a widespread problem until recently. While browsing the consumer awareness website RedFlagDeals.com, I met Rene who had twice been mistreated by Pizza Pizza and was sharing his story so that others might avoid a similar fate. Rene doesn't always go to the games, but when he does, he tends to get lucky. In 2008, he walked into a Pizza Pizza with two qualifying tickets to exchange for his dinner. There was a line in front of him, but he walked up to the display case tickets in hand anyways, to see if there was any cheese or pepperoni left (the promotion only allows for the redemption of cheese or pepperoni slices). Seeing that there were two pepperoni slices left, he returned to the back of the line, to wait his turn and chat with his wife. When his turn came to order, before even being given a chance to speak he was told there were no slices left, only squares (which are about half the size of slices). Naturally, he assumed that the customers in front of him had ordered the slices and he hadn't noticed. But then as he was looking at the display case, he noticed that the two slices had been moved onto the Meat Lover's tray, where they fairly neatly blended into the rest of the pizza. When he asked for the two pepperoni slices, the attendant replied "One cheese, one pepperoni, square slices. OK?" Rene repeated his request for 2 regular pepperoni slices to the anger of the attendant who put the two slices in the oven for 30 seconds, then threw them into a paper bag and slid them across the counter before moving on to the next customer. Needless to say, Rene was not impressed. Later that summer, my girlfriend and I walked into the Pizza Pizza at Yonge and Elm with our tickets from a game the previous weekend. We handed two tickets to the cashier and asked for one pepperoni and one cheese slice, both of which they had plenty of. The cashier put the pepperoni in the oven and then said we would have to pay a $0.50 surcharge for the cheese slice. Dazed and confused, we pointed to the sign above her saying that our ticket entitled us to a slice of cheese pizza for free. She said that they didn't have any "regular" cheese pizza, that they in fact don't make "regular" cheese pizza at this location, and that they only serve "4-cheese" pizza which costs more. So we were given the option to have another slice of pepperoni or pay a surcharge for the cheese pizza. At this point, we asked to speak to the Store Manager who wanted nothing to do with us and refused to give us his name upon request. We read the Free Slices policy out loud to him and explained to him that our ticket entitled us to a slice of cheese pizza. There was no clause in the policy that only certain franchisees participate or that they are under no obligation to provide the specified selection of pizza. Based on the policy, the store had to provide a choice of pepperoni and cheese pizza to customers upon request. The manager had no rebuttal to our claims, other than to tell us that he would not make a cheese pizza, even though we offered to wait 15-20 minutes while he made one. Eventually, after we essentially refused to leave the store or let them serve any other customers, the girl serving us capitulated and gave us the 4-cheese pizza for free, while the manager hid cowardly in the back of the store. All of this resistance seems disproportionate to the value of a couple of slices of pizza, doesn't it? Flash forward to the 27th of September, the final home game of the 2009 Blue Jays season. The pitchers combined for seven strikeouts and Rene was once again in attendance. He decided it was time to try his luck again, this time at a different location. Upon arrival, they noticed that the store did not have any pepperoni or cheese pizza in the display case - highly unusual for a Pizza Pizza storefront. He spoke directly to the manager who was manning the counter, and was told that it would be a minimum 20-minute wait for fresh slices. He was told he could get pizza quicker if he went to the next closest location, 5 or 7 minutes away, in a heavy rainstorm. Imagine the hospitality! Rene told the manager he was willing to wait and he took a seat not far from the counter. A few minutes later, another customer arrived with 4 tickets to exchange for free pizza. He was given the same message and told to go to another store. He too, opted to wait. Several minutes later, another couple arrived with tickets and was also given the same message. Seeing that three others were waiting for pizza, they too decided to wait. After another 20 minutes of waiting, the manager went to the back of the store and brought out half a cheese pizza and half a pepperoni pizza. He put two pepperoni slices in the oven for Rene. Upon questioning as to why he was reheating supposedly freshly made pizza, the manager ignored Rene and proceeded to find out that the man with 4 tickets wanted 4 pepperoni slices, more than was left. The man was told it would be another 20 minute wait for pepperoni pizza. It quickly became obvious to all those waiting that the manager in fact was not making fresh pizza, but was storing the pepperoni and cheese pizzas in the back of the store, hoping that in making them wait long enough, they would lose patience and leave. As the customers further pressed the issue, the manager slammed his hands down on the counter and said that he was running a business, and if they were unhappy with the wait, they should leave. All the customers left immediately, only Rene with pizza in hand. Not all experiences are as bad as the ones described here. Though I no longer go to the Pizza Pizza at Yonge and Elm, the location just south of Bay and College has graciously given me free slices without complaint throughout the year. And I'm sure for every horror story, there are 100 customers who have been happily served their free slices. But those aren't the stories that we remember. 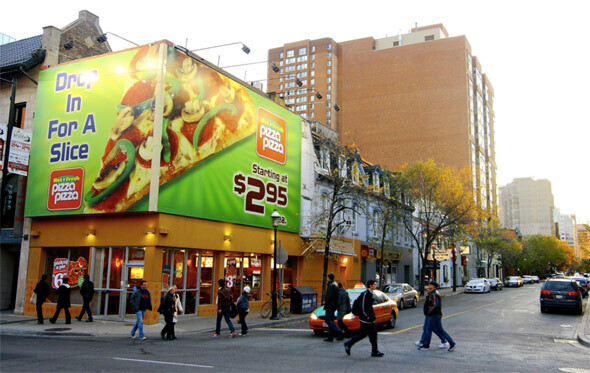 In a May 2009 Toronto Star article, Pizza Pizza marketing vice-president Pat Finelli called the promotion a "win-win situation". As this article can attest, I'm not sure some of the franchisees would agree. One has to wonder whether they're just stingy, or possibly getting a raw deal on the promotion. Regardless of the situation, some managers have clearly not realized that in business, you only get one first impression. Guest contributor Mathieu Morin is an engineer by day, and a sports fanatic and photographer by night. You can see more of his work at his daily photoblog View Found. First two photos by the author, third by AtillaSoylu on Flickr.